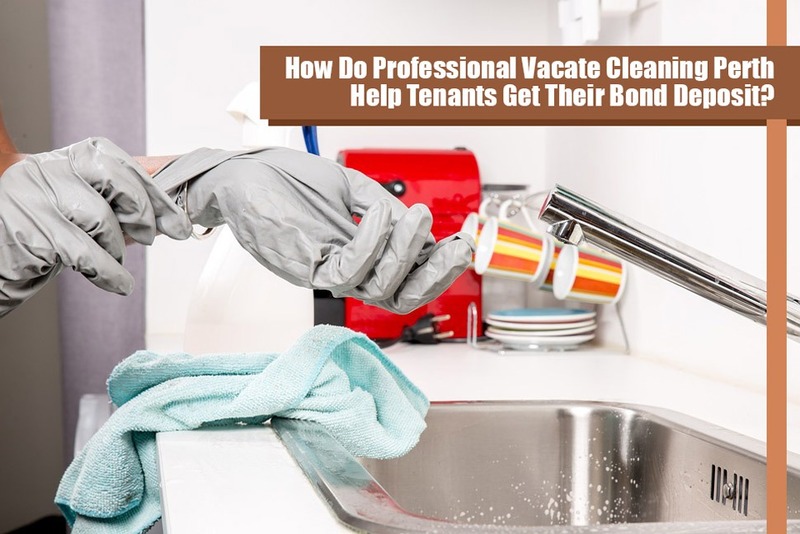 How Do Professional Vacate Cleaning Perth Help Tenants Get Their Bond Deposit? At some point, people may consider relocation for some reasons. And this situation requires them to clean their old place before they move to the new one. Well, if you are in this situation, hiring a vacate cleaning Perth professional can help you a lot. Moving should be a great experience for the tenants. But then, the daunting task of deep cleaning the old property can simply leave them stressed. Well, with advance vacate cleaning Perth services, you can get your old place cleaned in the best manner. Likewise, people who have signed a bond with the landlords could opt for this type of service to ensure that they have the excellent kind of clean. Moreover, this will further ensure them that they will get their bond back from their landlord. Considering that upon leaving behind a clean rental property, it creates a great impression on the mind of the landlords. Furthermore, vacate cleaning Perth services will help them carry out a thorough cleaning of their property, leaving no room for complaint from the landlord. Well, to fully understand the vacate or end of lease cleaning Perth service, it entails that the professionals would scrub rightly from top to the bottom of the property including the kitchen, bathroom, and bedroom. Thus, leaving your place with absolutely no signs or marks left behind. Well, this is the reason why you need the professional reliable cleaners for you to get the bond money back from the landlord. Rugs and carpets are among those prominent interior designing features of the house. They can be stained in case they aren’t dealt with properly. Well, the standard vacuum can’t get all the dust and the related bacteria which might have developed in them. However, a professional and expert vacate cleaning Perth service may help in making sure that the rugs are bacteria free. According to professionals, bathrooms are where most of the bacteria in the house resides. And even though you might be cleaning the bathrooms regularly, there’s still a need to deeply clean them. Well, this is why you need help from the expert to get rid of this germs and bacteria. This is also one way to make your bathroom look clean and refreshing through the touch of the pros. This might become much more imperative, but in case you are about to leave the house for good, you need to take it into consideration. In this way, you can satisfy your landlord and take back the whole bond deposit. Most people don’t really find time for cleaning the windows of the rental property. However, with the help of professional cleaners, you could make sure that your windows will be free from dirt and dust. The fact that they already know what to do and how to improve the appearance of your window, the job will be done with ease. Kitchen needs the thorough clean up the most. It’s not that easy to clean the ovens, stovetops, grills and other kitchen appliances. Gradually, grime becomes willful and does not come off no matter how hard you try to scrub it off. As someone who’s planning to move, vacate cleaning Perth services are necessary to fully clean your rented property. If your landlords got requirements, they can more likely give it to them. They will help you not only in cleaning your property thoroughly but as well as securing that you can get your bond money back. Not to mention the stress you might be facing when you do it yourself. Sound reasonable, right? Are you ready to look for a Cleaning Company? Well, you are on the right track! Maid in Perth is the right company for you. Giving you the guarantee of a 100% satisfaction. Call us today for more details and our team of professionals will be happy to assist your needs. Also, when’s the last time did you clean your carpet? See the signs that its time to clean it again and read this article: Signs You Need to Check Before Having Carpet Steam Cleaning Perth. This entry was posted in House Cleaning and tagged Deep Cleaning, End of Lease Cleaning, Move In Cleaning, Move Out Cleaning, Vacate Cleaning, window cleaning.